As I type these words I’m waiting for the return of my oldest son, Holt, from his senior prom. Obviously not an every-day occurrence, but certainly the perfect backdrop for a post about dating. It almost makes your palms sweaty just thinking about it, doesn’t? Talk about pressure!! Whether you had the daunting task of extending an invite, or the agonizing experience of waiting for one, prom inspires as much perspiration as it does anticipation. 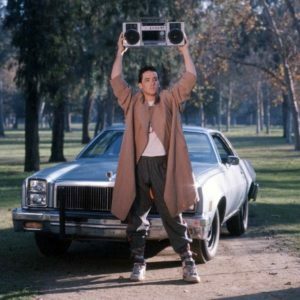 Whatever happened to simply blasting Phil Collins from a giant boom box held aloft outside the two story window of your beloved? OK. Maybe those days weren’t any better, but enough reminiscing, let’s see if I can get through this post before my son returns. Whether you’re planning an elaborate promposal, or merely extending an invite to coffee, purpose-driven dating involves “time invested in one other person.” Last week I shared what we mean by that, but this week I feel it necessary to clarify what we don’t mean. First off, one of the worst ideas our intimacy-challenged culture has sold us, is that dating should be defined by privacy. It’s simply no one’s business how you handle your relationship life. No one need know where you’re going, or what you’re doing, or even who you’re with. Unless you choose to post it on Instagram. And Facebook. And Twitter. And, of course, YouTube. So if anyone’s interested, they know where they can go for updates. Be deliberate about involving your friends in your dating life; particularly those who know and love you well (and know and love your God well)! For all the stupid motivations I had for dating, I am so glad I involved my friends! What would I have done back in college without my partner in dating, David Edwards? Why he helped me secure my first homecoming date! It was our Freshman year, in the student union building of Baylor University. That’s where we came up behind her, while she sat innocently eating her slice of Itza Pizza. And then it happened. David laid down the bad beat box and I rapped my invitation. Tonight, it gives me great comfort knowing Holt is at prom with someone he knows from youth group. She may go to a different school, but Holt and this young lady share common friends who all love Jesus. Two’s Company, but Four is More! Secondly, I wouldn’t dream of suggesting you avoid double dating! I’m a fan of even larger groups than that, but if it’s a date, you’re paired up. Back at Baylor, my three college roommates and I established a tradition of quadruple dating to homecoming. Not only did these guys (whom I loved like the brothers I never had) make the evening more fun and relaxed, I think going together helped each of us to man-up and get a date. I also double dated several times with my friend, David, mentioned above, including the Freshman formal where we cooked dinner for our dates. Obviously, we didn’t wind up with those girls, but we all had fun! Speaking of fun, how about our infamous “illegal date” where David and I more-or-less kidnapped our dates at (plastic) knife point, blindfolded them, and didn’t remove their blindfolds until we were on the 50 yard line of the Baylor stadium with a full picnic dinner complete with games to play afterwards. And yes, there was a giant boom box present, so Phil Collins could join us. Unfortunately, masked gunmen in black clothes and face paint broke up our little 50-yard-line festivities before we could get around to the board games. No, I’m not kidding about the gunmen. I’m also not kidding when I say this: If you come up with a date as creative as this, be careful not to let any of your friends who don’t have dates for the evening know, lest they decide to entertain themselves by ruining your own plans. Oh who am I kidding? A good time was had by all! I hope Holt is having a blast right now! And I’m so glad that, as he enjoys this evening, it’s not just him and her, because they went in a group of several other couples, which means he gets to know more about his date’s friends. Getting to know someone’s friends will tell you a lot about a person. Indeed, the evening began with dinner at the home of one of the girls, where each couple was waited on by the parents of each lovely lady present. So Holt got to spend a little time with the parental units too! Friend AND parental involvement? Forget about who’s Prom King and Queen. I crown these parents Prom Dads and Moms! So by all means, involve friends in your dating life! Involve family! And even double, triple, and quadruple date! But if it’s a date, consider your time an intentional investment in one other person. It’s the way you honor the person your with; by truly being with them. But there’s one other thing we don’t mean by “time invested in one other person.” We’ll get to that next week. This post is one in a series on Purpose-Driven Dating which we define as follows: Intentional time invested in one other person for the purpose of growing in intimacy that might lead to a life-giving, life-long marriage. This week’s focus: …time invested in one other person… The series begins with this post.